Will the 20700 battery be the future of the vaping industry? 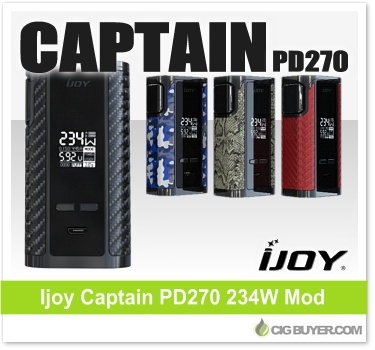 Ijoy thinks so, and the Ijoy Captain PD270 Box Mod is the first device to use them, providing more battery life and up to 234W of output with full temperature control (Ni/Ti/SS/TCR). It’s also compatible with traditional 18650 cells, but the new 20700 cell is being used by car maker Tesla and will likely become widespread in the vaping industry as well. The Captain Box Mod is a great looking device with a huge front-facing OLED display, easy to navigate menu, over-sized firing button and flip-open battery door. 24 replaceable side panels will also be available.